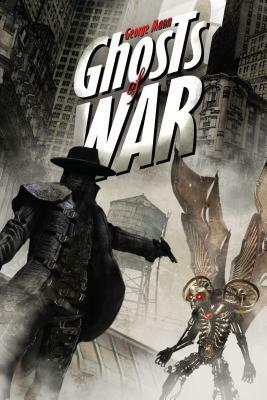 Ghosts of War picks up the story a month after the end of Ghosts of Manhattan. New York City is being plagued by a pack of ferocious brass raptors – strange, skeleton-like creations with bat-like wings that swoop out of the sky, attacking people and carrying them away into the night. The Ghost has been tracking these bizarre machines, and is close to finding their origin: a deranged military scientist who is slowly rebuilding himself as a machine. However, this scientist is not working alone, and his scheme involves more than a handful of abductions. He is part of a plot to escalate the cold war with Britain into a full-blown conflict, and he is building a weapon – a weapon that will fracture dimensional space and allow the monstrous creatures that live on the other side to spill through. He and his co-conspirators – a cabal of senators and businessmen who seek to benefit from the war – intend to harness these creatures and use them as a means to crush the British. But the Ghost knows only too well how dangerous these creatures can be, and the threat they represent not just to Britain, but the world. The Ghost’s efforts to put an end to the conspiracy bring him into an uneasy alliance with a male British spy, who is loose in Manhattan, protecting the interests of his country. He also has the unlikely assistance of Ginny, a drunken ex-lover and sharpshooter, who walks back into his life, having disappeared six years earlier in mysterious circumstances. Suffering from increasingly lucid flashbacks to WWI and subjected to rooftop chases, a battle with a mechanized madman, and the constant threat of airborne predators, and with the fate of the world hanging in the balance, can the Ghost derail the conspiracy and prevent the war with the British from escalating beyond control? George Mann is the author of Ghosts of Manhattan, The Affinity Bridge, The Osiris Ritual, and The Human Abstract, as well as numerous short stories, novellas, and an original Doctor Who audiobook. He has edited a number of anthologies including The Solaris Book of New Science Fiction and The Solaris Book of New Fantasy and a retrospective collection of classic Sexton Blake stories, Sexton Blake, Detective. He lives near Grantham, UK, with his wife, son, and daughter. You can follow him on Twitter at twitter.com/George_Mann. "This sequel to Ghosts of Manhattan pits the superhero protagonist against a mad scientist in an action-packed story patterned after the pulp fiction novels of the mid-20th century. Fans of steampunk and noir fantasy should enjoy this unassuming adventure."